The Rancid Summit was a lonely mountain that stood amidst the endless Velosian jungle, inconveniently located eighty kilometers from the nearest settlement. The place got its unfortunate name from its surrounding environment, which was so overgrown with toxic, poisonous and otherwise unpleasant plants. The flora was so voracious that various species of barely sentient vegetation fought each other violently for sunlight and soil on an hourly basis. The air itself was so heavily laden with spores and pollen that it made the area seem like it was perpetually drenched in a green fog. That stifling miasma made the environment so hostile to beings made of flesh and blood that not even orcs could settle in the region, let alone people. Which, incidentally, also made it a perfect place to hide a dungeon. A Gate Spell opened up halfway up the Rancid Summit’s southern slope, and two figures stepped out of it. The first was Boxxy, who was still in its base hylt creeper form, followed closely by Jen, who still clung tightly to its hand after accepting the creature’s proposal mere minutes ago. The shapeshifter rolled a nearby boulder out of the way with its free hand, revealing a deep crack in the barren cliffside. It silently led the fallen angel inside, guiding her deeper and deeper into the mountain’s underbelly. The dark and tight passage opened up into an extremely spacious cavern the instant the two of them entered the latest addition to Boxxy’s dungeon network. It was a bit remote, yes, but as the only means of quickly travelling between continents, it needed to stay as hidden and secure as possible. The Rancid Summit was quite suitable for this task, as the only people who ventured into this area were those looking to procure rare plant materials and would have no interest in the barren rock of a mountain. As for the dungeon’s name, it was just some generic appropriately sounding thing the monster had come up with on the spot. The dungeon core responsible for maintaining this hollow space hung idly in the air at the top of the cavern, bathing it in its soft white light. The interior was mostly empty, save for what looked like a doorway in the wall opposite the entrance. Fizzy was standing next to it with her arms crossed, her spark-filled eyes glaring at Jen so hard one would think she was trying to make her head explode with just her stare. The Monk, on the other hand, did not even seem to register the golem’s presence, which only served to piss the latter off even further. She wasn’t doing it on purpose, however, as her fragile state of mind made it impossible to focus on anything other than the monster leading her by the hand as if she were a child. She obediently followed it into that tiny side room, which turned out to be closer to a jail cell than a place of residence. It was about five meters wide, deep and tall, with impossibly smooth walls that made it seem like someone had just erased a cubic area of solid rock from existence. Boxxy led Jen to one of the far corners and motioned for her to stand there, which she did without saying a word. The shapeshifter then took a strongbox out of its Storage and placed it on the ground. It twisted the dials on the face of it a few times until it unlocked it with a heavy click. It then opened it up, causing a chilling white mist to pour out of the enchanted and highly secure icebox. Finally, it reached inside and took out a large crystal syringe with a ten-centimeter-long mithril needle, which was filled to the brim with a thick red fluid. It was a single word, but said without hesitation or doubt, which was as good a sign that she was ready as Boxxy could’ve asked for. The shapeshifter positioned itself behind Jen, who was now staring at the cubic chamber’s corner. She didn’t even get the chance to have second thoughts before the monster drove that needle into her back, between the gaps in her vertebrae, and into her spine. It then began administering the alchemical concoction with a smooth motion over the course of the next two seconds. It then pulled the needle out as soon as the syringe was empty. You are now under the effects of an Essence Transfusion Serum. Your body has begun to mutate. And none too soon, either, as Jen began convulsing and screaming the instant it did so. She fell forward, slamming her fists into the bare rock wall with enough force to break it were it not for the dungeon fortifying this place. Boxxy calmly exited the chamber and sealed it with a solid stone door, leaving the woman to thrash around and scream her lungs out in solitude. Even then it could still hear the thundering impacts and muffled wails as the Monk went berserk from the pain. It was probably a good idea it prepared that space, as it doubted whether anything else could contain her while she was in that state. The former house mimic called Wardrobzilla had been imbued with the essences of several monsters, giving him access to their respective Jobs and Skills. The process was documented as ‘essence transplantation,’ and was responsible for turning the harmless piece of sentient furniture into a violent monster. More specifically a changeling, a being that was many things at once, yet also none of them. As such, it was completely incapable of achieving a Rank Up, even if it did gain strength and magic far beyond its original form. Especially since the monster had no idea how to make more of it, but knew what it was capable of after running a few trials. Volatile alchemical solutions had an extremely limited shelf life, some even lasting for mere hours after being completed before they lost their potency. That much was common knowledge, so Fizzy’s question was hardly unwarranted. There were a multitude of reasons for this decision. One of those was the delicious irony of coercing a follower of Axel to willingly become that which they once hated. Another was that this also technically counted as revenge on Zone for taking away its Warlock Job back in the day, something it had never truly forgiven her for. There was also the fact that past experiences had taught Boxxy that monsters worked better with other monsters than enlightened. That way there was less chance for there to be a conflict of interests caused by silly things like morals. Jen’s loyalty was a problem, of course, but the shapeshifter had a fix for that. Ultimately, however, the defining reason for choosing this course of action was relatively simple. A message asking the golem to become the steward of this freshly-made dungeon popped into her mind. In fact, the dungeon didn’t even exist until about fourteen hours ago. It tried putting in a request to hire a dungeon master from Demons ‘R’ Us, but unfortunately there seemed to be no takers. Hardly surprising considering this place was supposed to remain a secret, meaning its caretaker would have literally nothing to do. And if there was one thing that all demons shared a hatred for, it was being bored to tears. Boxxy still wanted someone around long-term, however, as this dungeon was of high logistical importance, so having a reliable caretaker was a must. Fizzy accepted the offer and officially became the active dungeon master for the Dark Eyrie. Boxxy then gave her a quick rundown of all the features and functions, as well full access to all of them. Unfortunately it had responsibilities to take care of as Keira, so it didn’t have time to go over all of the intricacies of dungeon management. It trusted the golem would be able to figure things out, though. She was a clever girl, after all. Being able to do that was kind of the whole point of setting this place up to begin with. It was not exactly free, however, as the sheer distance between the two continents meant it took over 90% of the dungeon core’s 20,000 MP capacity to transport Boxxy to Atica. And even then it couldn’t send the once-mimic all the way to Azurvale in one shot. The shapeshifter had to first stop over at one of the southern dungeons under its control, then use its MP reserves to transport itself to the northern part of the continent. It was a pain in the lid, but still infinitely faster than spending two weeks on a ship and another two by carriage or caravan. Unfortunately Boxxy and Fizzy would still have to take the long way back home once Keira left Velos if they hoped to maintain their public image. Showing up at the elven capital nearly a month ahead of everyone else was sure to raise questions. Admittedly it wasn’t as if owning nearly a dozen empty dungeons was illegal or anything, but it was probably for the best if the authorities never found out. Not to mention Keira still had to pick up Teresa’s bastards from Empire territory. “That’s a lot of stuff,” Boxxy remarked. The objects in question were a trio of mithril dolls made by Fizzy for the sole purpose of bringing them to life through her Animate Armor Skill. She had a set of them shipped to Velos along with herself, but there was another batch hidden in Boxxy’s primary dungeon. There were only six of them in existence, and making more was extremely difficult due to the scarcity of the necessary materials. Not the precious metal that made up their outer shell though, that could be procured easily enough with the power of money. What made it difficult to replicate those articles were the various war golem parts they required - specifically cores, voice boxes, eyes and ears. The mechanisms in question were what allowed Fizzy’s alter egos to gain such complete and total control over the armored dolls. The only way to obtain these, at least as far as the shapeshifter’s troupe was aware of, was through the Golem War Zone instant dungeon, courtesy of Patrick’s Divine item. Just gaining access to it was difficult enough, as it had to be randomly selected out of a pool of about fifty or so presets and the Atlas of Dreams could only be activated once every five days. Even then there were a bunch of hidden objectives that had to be cleared before one could earn the inert and intact war golem cores that were necessary to make those dolls truly come to life. After the golem was done listing off all of the raw materials she’d need, Boxxy began the process of relaying itself to its home base. Lavender the alraune greeted it with her normal enthusiasm upon its return, despite the fact that it had been less than a day since she last saw it. As for Ambrosia, she was still in the middle of her ‘quick six month power nap,’ so it was unlikely she’d be up anytime soon. It was regrettable Boxxy wouldn’t get to enjoy her nectar-based cuisine for a while, but it could always use the Elder Dryad’s Authority to wake her up should its cravings get too strong. Ambrosia loved to spoil her surrogate child, so she would probably not mind its insolence too much. The monster was still in the middle of sorting through its coffers when a message popped into its head. Fizzy: Is this thing on? Lavender: Oh, it’s the shiny friend! Hello! Boxxy: Lavender, please don’t interrupt me when I’m talking with Fizzy. Lavender: Sorry, Boxxy! Whatever you say, Boxxy! Well, that was surprising. The monster had never had multiple dungeon masters before, so it had no idea they shared the same cross-dungeon communication channel. That was certainly good to know, though perhaps not the most important thing right now. Boxxy: What is it, Fizzy? Fizzy: You know how you told me to contact you when Jen stopped screaming? The few times Boxxy experimented with the essence transplantation concoction, its test subjects writhed around in agony for two to three days before expiring. According to the documents it had pilfered along with the serum, these fatalities were caused by a ‘synaptic something-something bonding failure.’ In layman’s terms it meant that there was poor compatibility between the host and the implanted monstrous genes, and their body was too weak to handle the stress of the transition. That was why it chose to give Jen a dose of harpy serum. It wasn’t the strongest monster it could have attempted to turn her into, but it seemed the most fitting considering harpies looked half-human to begin with. Not to mention that giving the Monk her wings back was a good way to earn some loyalty and goodwill. Fizzy: Oh, no, nevermind. She just started again. Must have passed out or something. Boxxy: Next time, try checking her condition with the Prison Management module before you jump to conclusions. Fizzy: For the record, if she lives through this, I’m going to hit her again. This time with everything I’ve got. It would seem the golem was still carrying a grudge over the way Jen sabotaged her jetpack and tossed her out of the ring during their last tussle in The Gauntlet. That said, if she truly did go all out on that one hit, there was a good chance even that Monk would be turned into a bloody smear, defeating the entire purpose of this exercise. Boxxy made a mental note to placate her as much as possible while it could, then resumed packing the rest of the materials, tools and items its trophy wife had requested. Once it was done stocking up, it returned to the Velos dungeon and dropped everything off with Fizzy. A quick spit-shine later it left the dungeon and returned to Oar’s Rest with a Transfamiliar and a Gate, then resumed masquerading as Keira. It did a number of Quests the local guilds were offering, mostly to gain reputation and favor rather than money. It had two whole rooms overflowing with gold and treasure back in Azurvale, so the amount earned here was paltry at best in comparison. Not that it was complaining about getting more gold, but it wasn’t nearly enough to salivate over. Its hard work since coming here paid off the next day when Keira was invited to stand before the Council of Elders, the ruling body of the Eight Tribes’ government. As one might expect, they were made up of eight wizened raptors, each representing a branch of raptor society. They held a small ceremony officially thanking and commending the catgirl for her contributions towards quelling the massive orc scourge that Gutzstompa started. The whole thing just reeked of politics, however. They were treating Keira as if she were a foreign dignitary of some kind, despite the fact she had come here in a purely personal capacity. Still, they gave her a shiny new medal that was unique enough to add to Boxxy’s collection, so the shapeshifter didn’t mind their hollow flattery too much. The doppelganger spent the rest of that day playing nice with the locals, and that evening playing nicer with Rowana. The couple had just gone to bed when Fizzy contacted it for the first time since they last saw each other. Fizzy: Boxxy, Jen went quiet again. I think that monsterfication serum has run its course. Fizzy: I think so. The race on her Status is no longer listed as Angel (Human), but Changeling. Boxxy: Oh-hoh! Alright, I’ll be over as soon as I can! Your species has become Changeling. Feat of strength performed! You have unlocked a new Perk: Divine Beast. Congratulations, you are now a Level 1 Harpy! DEX +3. AGI +3. END +3. The tortured woman in question panted heavily within her stone cell. She was splayed out with her back against the cold floor, staring absentmindedly at the only witness to her ordeal - the magical lamp embedded in the ceiling. Its dim white light shone upon the walls, which were positively plastered with several layers of the Monk’s dried up rust-colored blood. Mostly a result of her thrashing about, as the only way she could bear the pain was by repeatedly smashing her hands and feet against the confines of her new home until she passed out. The self-destructive behavior might have gotten her killed if it wasn’t for Fizzy dropping in to mend her wounds whenever she was unconscious. But that was then, this was now. And at present, Jen was something that could only be described as a freak. Though she maintained most of her human features, all of her hair had fallen out, having been replaced with soft black plumage. Several rows of giant raven-like feathers ran down from her shoulders all the way down to her wrist, giving her a pair of bizarre half-wing half-arm limbs. Her feet and ankles had also undergone a significant change, as they were now bird-like without a single trace of humanity in them. If Boxxy were to see her current form, it would most definitely brand her a failure. She looked weak and miserable, her body noticeably thinner and feebler than it used to be. Not to mention her bones had become more fragile as a result of becoming light and hollow like a bird’s. Though the transformation into a half-harpy might have been an upgrade for a regular human, the opposite was true for one who had already evolved to the next level. Which was why the Foundation discontinued testing this serum on people, as they’d never had an unranked enlightened survive the process. However, it was rather fortunate for both Jen and Boxxy that the latter was still en route, otherwise the shapeshifter would have disposed of her without realizing there was more to come. The effects of Essence Transfusion Serum have been amplified. Her raptor lineage, her desperate desire to achieve a stronger form, her absurd vitality, and the unknown abnormality in the slightly expired monster serum all fit together like an unseen jigsaw puzzle. The extremely unlikely combination forced her unstable biology to adapt and overcome all of those defects she had acquired. Another round of pain coursed through Jen as a result, but this time around it was of a different quality. It was an oddly satisfying pain, like vomiting after eating something rancid, popping a pus-filled pimple, or pulling out an especially troublesome tooth. That was why even though it still hurt like her entire body was on fire, Jen’s responses were only grunts and snarls as opposed to the wails and screams of the past two days. The changes brought on by this second round of mutations were much more severe, but also much faster. The plumage covering her scalp fell out all at once and was instantly replaced with luscious black shoulder-length hair that could easily be called a mane. A disgusting ripping noise could be heard as a pair of triangular feline ears eerily similar to a beastkin’s popped out of the top of her head. The raven feathers on her arms fell away while a massive pair of hawk-like wings sprang out of her upper back, much larger in size than the ones Axel took from her. Her upper pair of limbs also underwent drastic change, starting from the nails on her hands that grew out to become sharp and sturdy claws. Short golden brown fur rapidly grew out of the skin on her forearms, covering them from the tip of her fingers all the way up to her elbows. The same lion-like pelt enveloped her legs from the lower thighs down until it reached her raised ankles. Her bird-like feet remained, though the talons became noticeably larger and blacker while the leathery hide covering them grew thick and heavy as they filled up with new muscle. Not just the feet, but her entire body started to bulk up considerably at this point. Whatever muscle mass she lost during the last two days was returned with interest, as her body visibly grew until it was one or two sizes larger than it used to be before this all started. Jen let out a bestial roar as a long, slender and flexible tail covered in more brown fur and tipped with a tuft of soft white hair rapidly grew out of the lower end of her spine, completing her transition. The effects of Essence Transfusion Serum have expired. Your species has become Harpy (Griffin). Congratulations, you are now a Level 1 Griffin! STR +5. END +5. AGI +2. Proficiency level increased. Wind Assisted Flight is now Level 1. INT +4. END +2. It was at that moment that the door to Jen’s cell slid open to reveal the world’s most dangerous hylt creeper. Something the newly reborn part-harpy part-griffin didn’t seem to appreciate, as she lunged at it like some sort of feral creature. Boxxy responded immediately by dashing forward to intercept her, grabbing her by the throat and choke-slamming her into the ground. Jen continued to snarl, growl and thrash about in a truly inhuman, but also highly irrational manner, forcing the shapeshifter to climb on top of her and pin her down with its considerable body mass. It was at the point where she tried and failed to bite off one of the tentacles holding her head, arms and legs in place that Boxxy noticed her eyes were unfocused and darting all over the place. The shapeshifter then realized Agent of Chaos was still in effect despite the rather impressive looking transformation. It seemed as if its next course of action would determine whether it snapped Jen out of this bestial frenzy or condemned her to it. While having her be as ferocious as possible sounded like it would be kind of fun and interesting to see, that was not why it wanted to recruit her. Physical prowess was certainly important, but it was Jen’s copious battle experience and single-minded personality that truly made her a force to be reckoned with. It was therefore preferable that she be returned to her previous state of mind. And who better to reign her savage side in than the only man Boxxy had known to be capable of keeping her in line. Boxxy’s quick thinking seemed to have done the trick, as the monstrous woman instantly ceased her struggling and stood perfectly still. She kept staring up at the creeper’s misshapen head and beady yellow eyes for several seconds until some semblance of light returned to her previously vacant eyes. She blinked several times as if only now waking from a two-day-long nightmare. Which, for all intents and purposes, was the case. The doppelganger allowed itself to relax a little, as it would appear the turbulent period of heightened uncertainty had finally passed. Or it could just be starting, if Jen’s one-word question was any indication. The drowsy voice, the dumb look on her face and the softness of her gaze were so foreign that they momentarily threw Boxxy for a loop. She looked like a completely different person, to the point where it wondered whether her mind had survived the agonizing transition to monsterhood. Fizzy’s most certainly suffered some irreversible changes during her golemification, so permanent brain damage was a very real concern in retrospect. Thankfully that didn’t seem to be the case, as Jen shook her head rapidly as if to dispel some sort of lingering daze, causing her usual emotionless mask to reappear moments later. 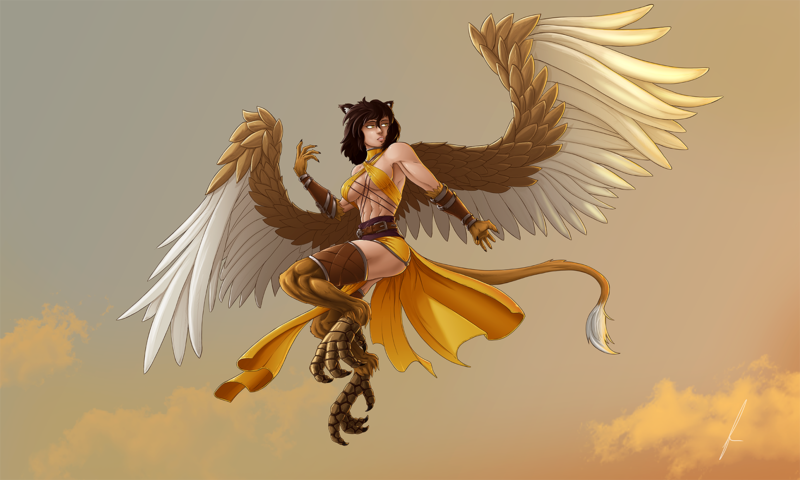 Boxxy nodded and released the griffin-girl from its grasp, allowing her to stand up and look herself over. She had certainly become something that would never be able to pass off as human. A skirt could theoretically conceal those freakish legs, but there was no disguise that would be able to effectively hide those wings. Her new body was also significantly taller than it used to be, as the serum had bumped her up from around one hundred and eighty to an imposing two hundred and fifteen centimeters. -but her growling stomach beat her to the punch, causing her to blush lightly from embarrassment. The shapeshifter then threw an arm around Jen’s shoulder and ushered her out of her cell. New Zone hype! Wonder who's going to be stronger after she gets a few more levels, Zone or Fizzy? They're gonna be bitter rivals, calling it now. at least they cant be rivals about getting boxxys atention, i mmean how can anyone compet with a mithril golem for the attention of a monster that loves shinies? Hm, you mentioned that Fizzys Animated Dolls were made of mithril, but shortly after you said: "Not the white gold that made up their outer shell". Is white gold correct here, seems weird for a animated armor which should be made of mithril and white girl is not really a robust alloy? White gold is mithril in this story, I just didn't want to repeat the word too much. EDIT: Ah, it's a real-world alloy. I'll rename it, I guess. I think that might be troublesome, as it's mentioned already in the first book, which you have published, that mithril is called white gold. In Tolkein's work (as he invented the word "mithril") it was sometimes called "truesilver". So the expired essence was altered by the flows of chaos to become a random bird-divine beast serum? Guess Zone should thank Harriet the God of Roulette wheels for not ending up a divine emu with bones for teeth and the smell of old banana skins. 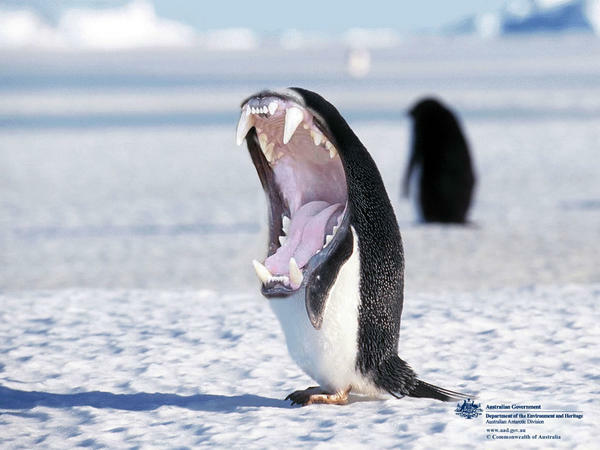 See, look at those cute fangs, now if we cast a growth spell on it and gave it frost breath...its normal for penguins to eat dragons right? Divine Beasts are beasts/monsters who have jobs related to divinities, like monks, paladins, priests. Or general Believers, though they may be really ancient. I think Ambrosia is a Divine Beast too, but I think it's more because of the blessing from, uh, the Forest Goddess that has made it so. if i remember right ambrosia is not a divine beast but a dam demi-god, it basiclly just means dont for the love of god mess with one of the 12? ancient druids as they can whip you into shape in secoends. or in ambrosia's case, cook you up into a 32 course meal. you think she has no learend new ways to cook people up again so it turn out more then 32 course meal? Cooking someone into a 32 course meal becomes an issue of the ingredients not being enough for proper courses I'd say. she probably knows more than 32 ways to cook enlightened, but there's only so much material to work with, even with the waters of life. there would still be deminishing returns. even if she were to feed him all of the 32 courses, that'd just provide enough materials for maybe 5 more courses. the body is remarkably bad at using what you eat. it was more for added torment, that she would do it. yes, because being chopped up into food over and over again while the waters of life prevent you from dying isn't enough torment. she still has her monk job, so why wouldn't she have her scribe job as well? lost/altered in the mutation? God of oops and Tacos did something? if I remember corectly Nasty did lose some abilities when going from ghost 2 Lich, howewer one skill went from no mana cost 2 costing mana 2 use. But since none of the Blue status updates mentions a loss of scribe class it should be safe 2 asume she still got it and related skills, afterall Fizzy went through a similar situation and her class/skills remained the same..
To expand on what Almarna said and explain why that matters. As seen in the Foundation Arc the Majority of jobs and stats are tied to the body, the only ones that aren't are the Hero Skills. Normally a Necromancer preparing to become an Undead has to do some rituals/work in order to keep their Jobs/Skills/Stats after Dying. Valeria didn't she just got stuck in the dungeon.